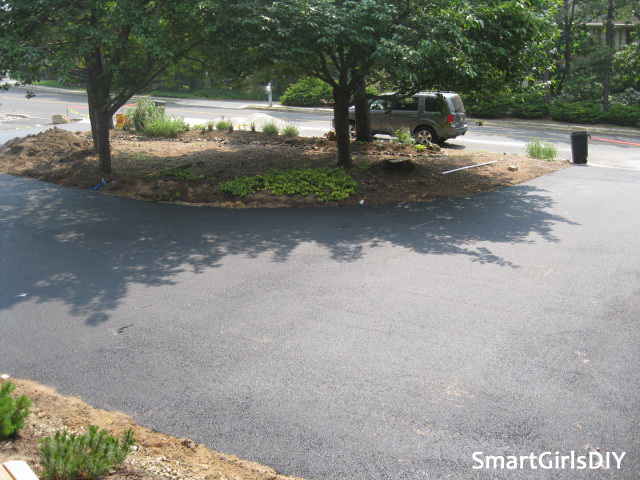 Obviously installing an asphalt driveway isn’t a do-it-yourself kind of job. I was okay with that. I’m even glad I paid someone else to do the demo. 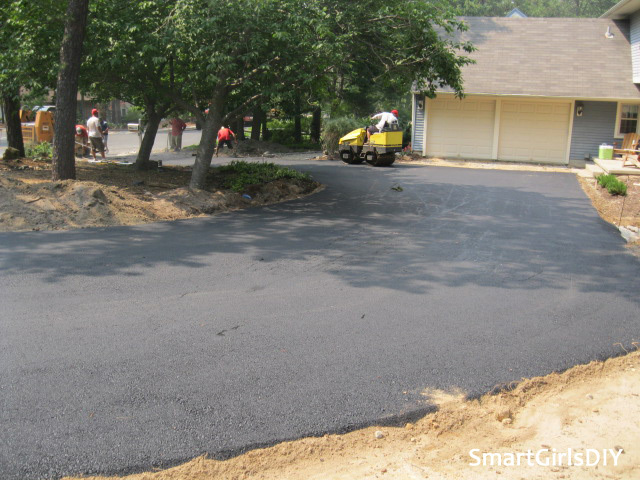 I used Garden State Paving and the guys were great! They estimated it was 2,400 sq ft of driveway and charged me $3,795. That’s a sweet deal. Plus, not everyone wants to deal with a chick who’s never done this before, but they were game. The job was done in a single day, despite it being the hottest day of the year. I brought out a cooler of drinks at one point. This is what it looked like when they got there. First they fine graded the area. That meant dumping this load of sand and spreading it around. They used some of the gravel sitting in the road too. That was from a delivery I got and they brought the wrong color stone and I couldn’t tell until they started pouring it onto the road. 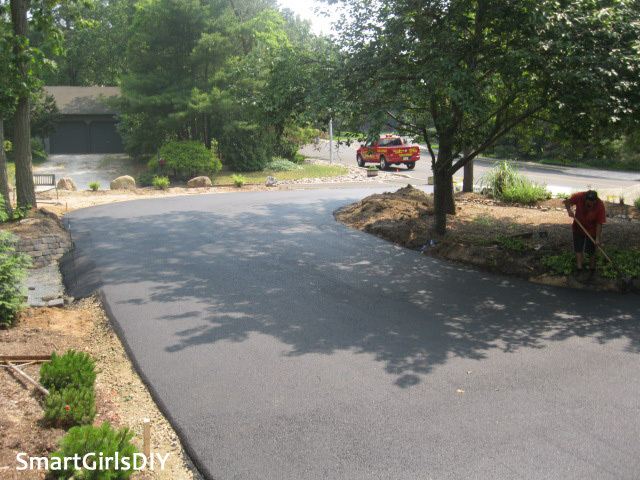 Instead of them having to shovel it all up, I figured the asphalt guys could just add it to the base layer. And that ‘s what they did. We had to mark out exactly where the asphalt would go. It was not as easy as showing them this plan and having them takeover. Nope, if I was going to act as the designer and general contractor, I had to make all those decisions. That meant getting out my tape measure, defining the center, top point, defining the radius, deciding how wide everything would be, etc. It all worked out fine in the end. This was the vision. This was the marking out stage. Yeah, they were posing for a picture. This is on the left side by the existing concrete apron. 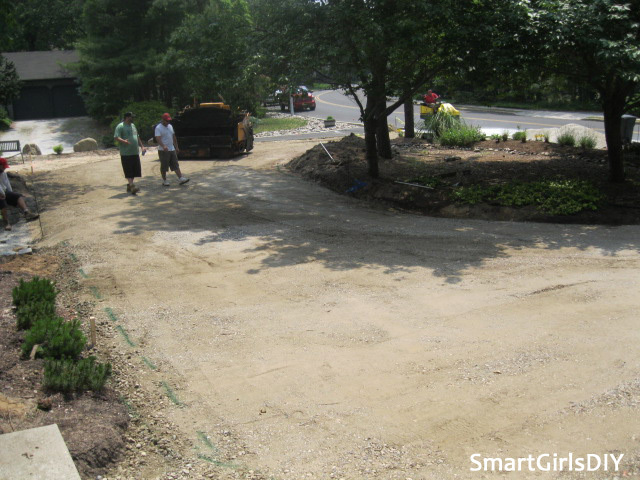 This is the other side, where the new concrete apron had been put in 2 months prior. 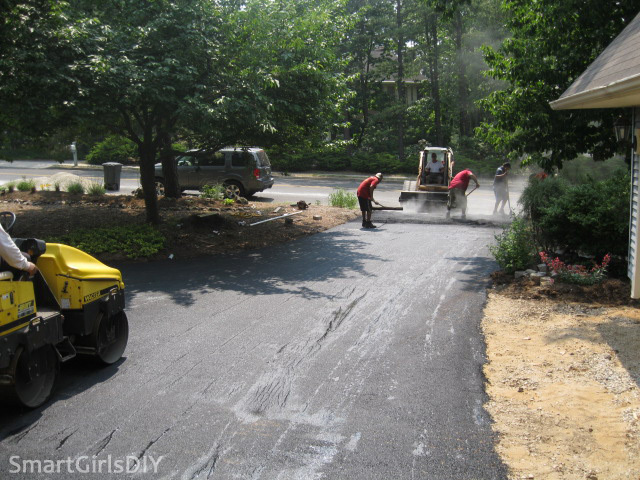 Which happened to be a perfect call on my part, hiring the demo guys to put in that apron so it had time to cure before these guys came to install the asphalt. They didn’t drive their truck onto this entrance though, just the roller truck thing. All marked out and ready to go. This was the truck that poured the liquid asphalt. Did I mention it was like 100 degrees that day? Poured and spread. And smoothed out. All finished. But clearly needing some serious landscaping. These areas were later filled in and leveled by hand. My hands. 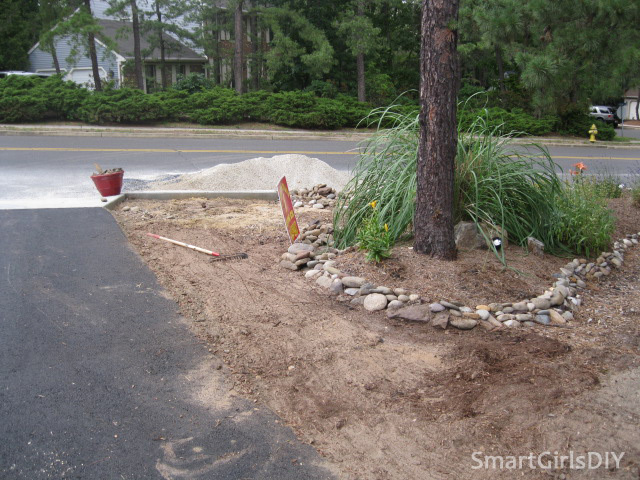 This front corner area eventually got a flower bed in 2013. 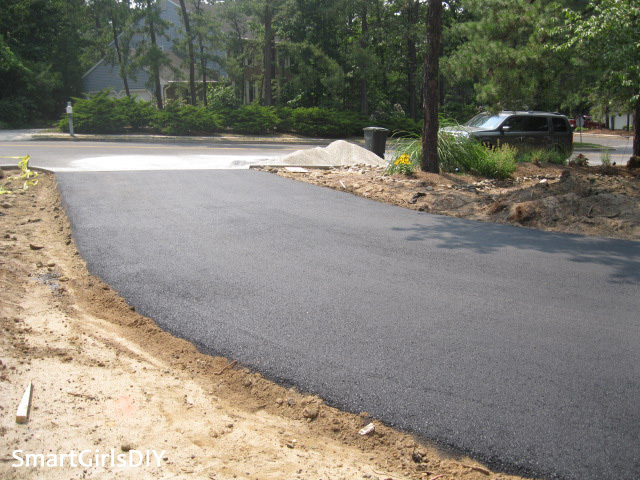 The area between my new driveway and my neighbor’s driveway/road was an area of contention for years. I was in criminal court 4 times in 2012 and ended up paying the town a $1000 because of this area. Ain’t living in NJ grand? This is one area I wasn’t happy with. 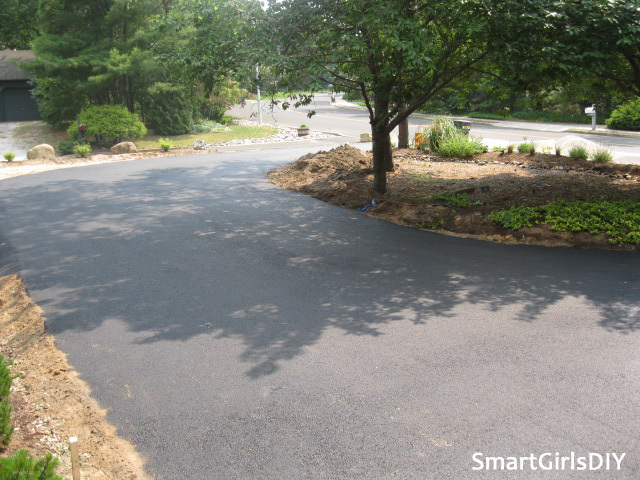 The asphalt guys asked me what I wanted them to do where the asphalt meets the gravel pathway, and this is what I agreed to. 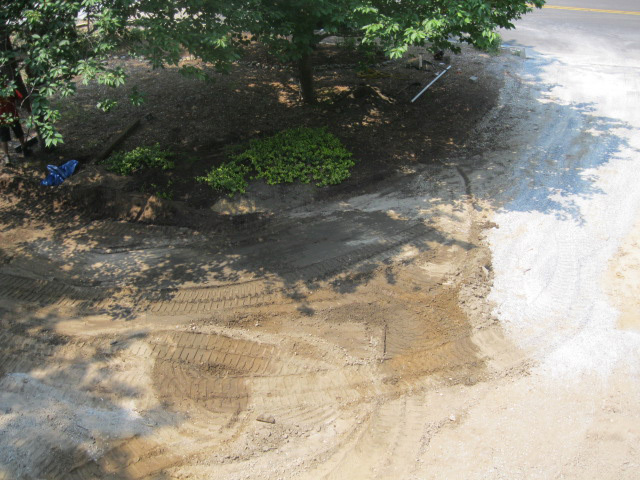 But I hated it and later chiseled a bunch of the asphalt away and ran the gravel up higher. I could have (and still can) put in a transition piece, like a railroad tie, to keep water from flowing off the asphalt and down the path. But I didn’t like the look of it. Too much going on already. 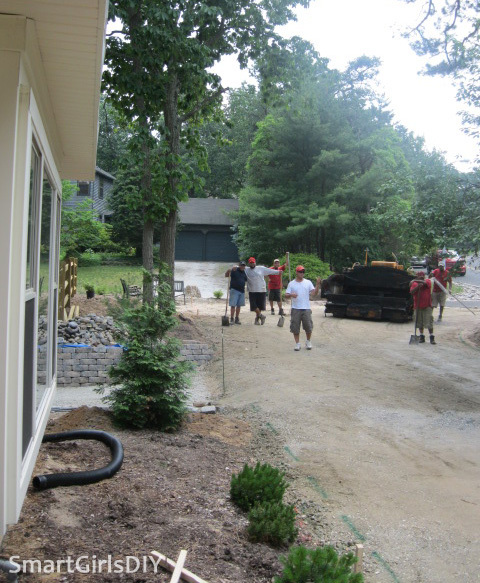 We dealt with the unfinished area in front of the garage for a year. 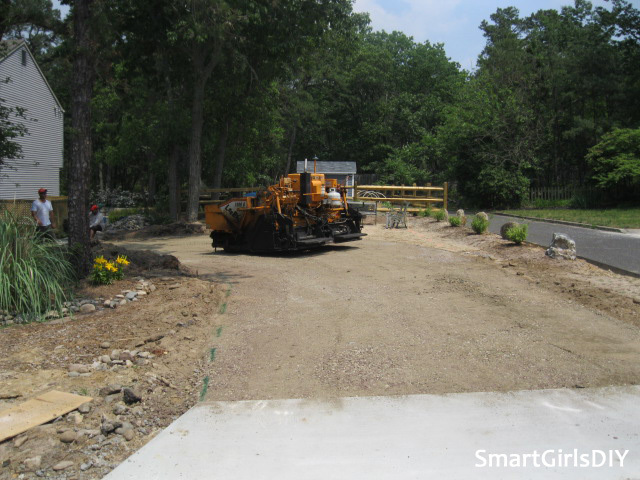 It took me that long to come up with the $$ and a contractor to do the stamped concrete. Remember, we never planned on doing any of this construction stuff when we bought the house. But, hey, I love the way it turned out and I’m so happy we did it. There are a bazillion more projects I tackled that summer, so stay tuned! Looks like a great job! Doing work on the exterior of your house can really increase the value so the investment is totally worth it. Thanks for sharing!